Got out tonight for a few short burst of observing amidst other things. I set up the C80ED and caught the young crescent moon as it was going down. Above is my best shot. It is still wildly inferior to the one I have up in the banner image, to the right of the blog title. That one I shot with my XT6, which had about three times the light gathering ability and almost twice the angular resolution of the C80ED, and I got that shot one night earlier in the lunar cycle. That was back in the early days, when we were still living in Merced. 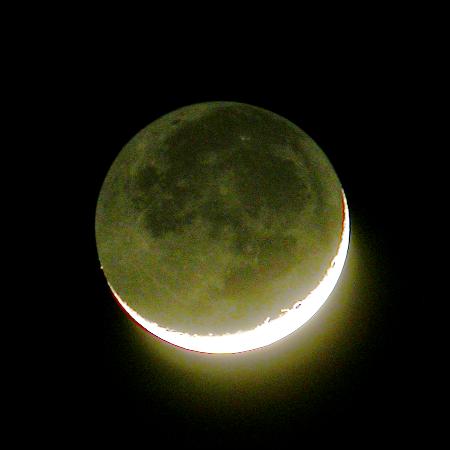 From my driveway I had a straight shot almost to the horizon, so I could catch a 2-day old moon. Here I have lots of trees and buildings in the way, so I generally have to wait an extra night to get a shot at the moon from the driveway. 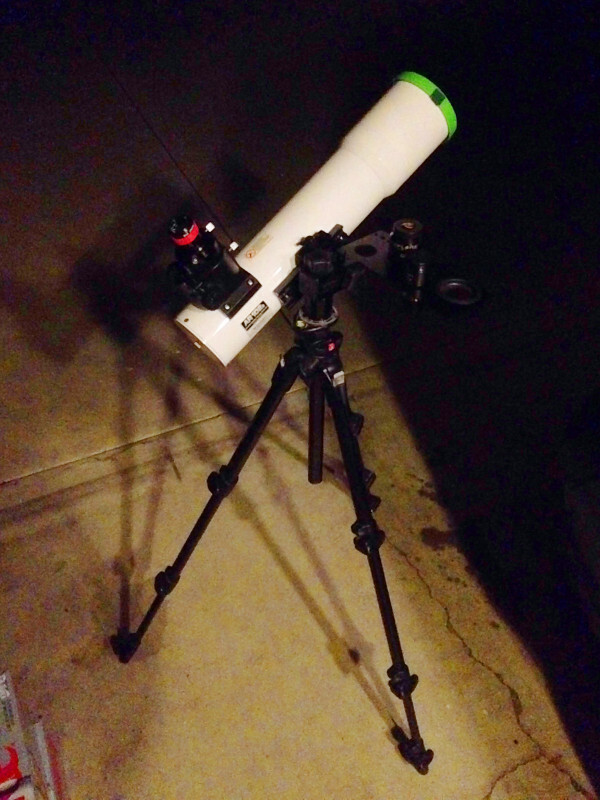 Then I was out again in the half hour before midnight to try some things with the Bresser Messier AR102S Comet Edition. First, I put it on the lightweight Manfrotto CXPRO4 tripod and DwarfStar alt-az mount that I have previously only used for much smaller scopes (example 1, example 2). Orion was going down over LA so it was pretty stinky, but I still had a long look at both the belt and the sword, and I powered up to split the Trapezium and Sigma Orionis. Then I swept up to hit M35 in Gemini, then back down to Meissa at the ‘head’ of Orion. I finished on Jupiter, using the 60mm aperture mask to knock down the CA. I was deliberately bouncing around the sky, looking at a variety of targets at a variety of magnifications, to see if the Manfrotto/DwarfStar combo would keep up. 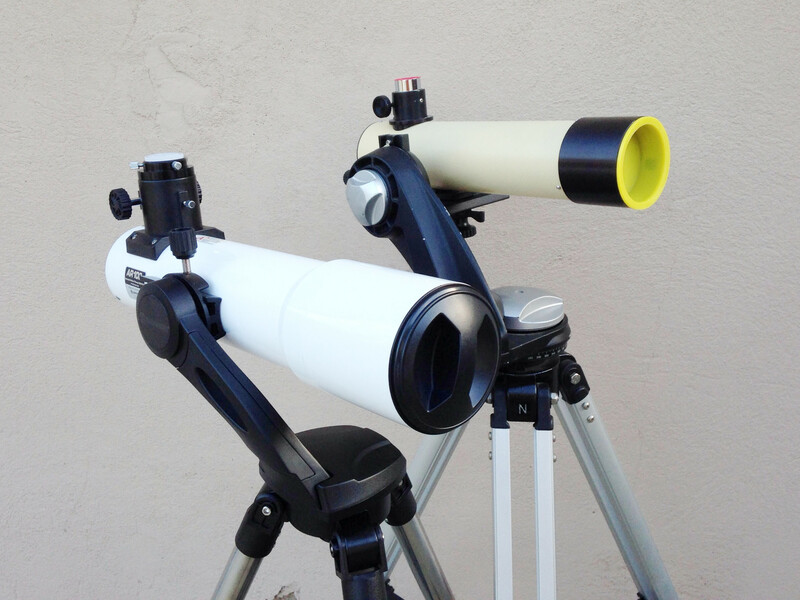 I’m a pretty forgiving observer – witness my near-pathological devotion to cheap scopes and stuff made out of junk – but one thing I just can’t handle is an undermounted scope. My first Mak was a 4″ which I hated and sold away before I realized that I hated it because I’d never put it on a solid mount. That experience left me traumatized when it comes to rickety mounts. The Bresser/Manfrotto/DwarfStar rig doesn’t look like it should work. It looks like the definition of a spindly undermounted disaster. But it was fine. I never had any problem slewing, tracking, or focusing. It helps that the Bresser is lighter than it looks, and carbon fiber is a lot stronger than it looks. I was also pleasantly surprised by the views I got of Jupiter. To get to a decent magnification I used the 8.8mm ES82, both natively (52x) and Barlowed (104x), and a Celestron 8-24mm zoom dialed down to 8 (57x). In both eyepieces I could see the North and South Equatorial Belts and stacks of minor belts marching away toward the poles. There was some CA, but I could minimize the effect by keeping Jupiter in the center of the field, and my eye centered over the eyepiece. The view was so good that I slipped out of gear testing mode and just stared for a few pleasant minutes. I was also happy to find that with the rubber eyeguard removed, I could see the entire field of the 8-24mm zoom at all magnifications while wearing glasses. Which I have to do now. In fact, the other night at the Salton Sea I made almost all of my observations with glasses on. mwedel, I read and enjoy your blog, let me suggest nicknaming the 4″ “The Ferret” as King Louis XV called Messier. That is a lovely suggestion, and it put a huge smile on my face. One thing I haven’t blogged about yet is that basically by serendipity I managed to pick up an 80mm prototype of the Bresser ‘reflactor’. So now I have two, big and little, otherwise nearly identical. Ferrets are mustelids (weasel family), along with wolverines, badgers, skunks, fishers, martens, stoats, weasels, and otters. My late grandfather was an accomplished taxidermist and one of his stuffed badgers is sitting on top of a bookcase about four feet from me as I type. It’s just about the same size as the 4″ reflactor. So I’m going to take your charming suggestion, with one modification: the 80mm will be the Ferret, as I anticipate some effort to ferret out all the Messiers with it, and the 4″ is henceforth the Badger, because it can just knock them around with all that aperture. Thanks for helping me solve that long-standing and vexing problem! You are currently browsing the 10 Minute Astronomy blog archives for the day Wednesday, March 1st, 2017.